The Salvador Dali of Folk Music, according to one wag, Baby Gramps is a high-energy, humorously entertaining, and occasionally mystifying performer with a voice of gravel and a staggering repertoire. 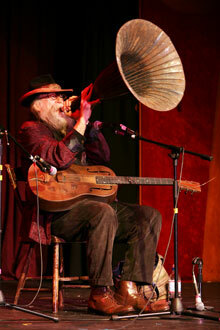 Accompanying himself on an antique resonator National Steel guitar, Gramps sings unique arrangements of rags, jazz, blues, and novelty songs from the 1920s and ‘30s, plus plenty of originals in an unforgettable show brimming with crazy wordplay, wild humor, and throat singing! He recently toured internationally as part of the Rogues Gallery: Pirate Ballads, Sea Songs, and Chanteys CD Concert Tour with folks like Marianne Faithful, Martha and Rufus Wainright, Lou Reed, and Suzanne Vega. The Rogues Gallery CD, produced by Johnny Depp and Hal Wilner in connection with The Pirates of the Caribbean films, also led to Baby Gramps appearance on the David Letterman Show. 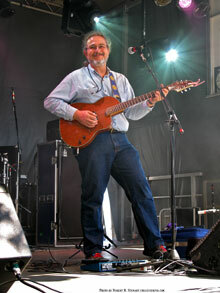 David Gans is a veteran of the music business as a songwriter and performer, a folk festival favorite, and a radio producer (he hosts the nationally syndicated "Grateful Dead Hour", and of "Dead to the World" on KPFA). Tonight, David performs his own engaging, "warmly cynical" songs that encompass a variety of styles that fall within the americana and jam-band spectrums. David’s most recent full-length CD is The Ones That Look the Weirdest Taste the Best.